Dr. Cornel West and Tavis Smiley are still making the media rounds. This time around, the dynamic duo found themselves at 'The O'Reilly Factor' with Bill O'Reilly over on Faux...I mean Fox News. What ensued was television gold as the two sides sparred over Wall Street corruption and the Occupy Wall Street protests. (HuffingtonPost) O'Reilly brought them on to discuss the Occupy Wall Street movement and poverty in America. He set up the conversation by saying that the two were overlooking key statistics in their battle against poverty that showed the problem to be as much one of "personal responsibility" as economic injustice. Then, he turned to West. "Where am i going wrong?" he asked. West said that his "lens" was wrong, and that he was overlooking the widening economic inequality in America. "The oligarchs and plutocrats that you tend to want to promote rather intensely [are] not only doing well but been too greedy!" he said. "I don't think I'm promoting anybody who's doing untoward things," O'Reilly said. "We're talking about chronic excess!" West responded, causing O'Reilly to try to shut him up. "No filibustering here," O'Reilly snapped. He said that what Smiley and West seemed to want was for the government to "forcibly seize" money from the rich and give it to the poor. "That's socialism and that's not going to work here," he concluded. "It wasn't socialism when we bailed out the banks in the first place?" Smiley said. He started to say that O'Reilly had been "right" in a recent attack on Stanley O'Neal, the former head of Merril Lynch. O'Reilly misheard him. "Lied about it?!" he thundered. "What do you mean i lied about it?!" "I said you were right!" Smiley said. "R-i-g-h-t!" O'Reilly apologized, and assured his guests he was "calm." Things got a lot less calm right afterwards, though. Smiley asked why O'Reilly was focusing on O'Neal, one of the few black CEOs of a major firm, causing O'Reilly to shout, "we treat everybody the same here!" Smiley disagreed, and wondered why, when Occupy Wall Street protesters were being arrested, no "bankster" had gone to jail "to pay for his crimes." "They didn't violate any laws!" 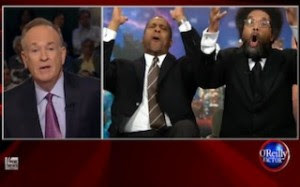 O'Reilly said, prompting Smiley and West to essentially lose it. "OOOOOHHHHHHHH!" they both said together. "How do you know?!" West yelled. "There's been no investigations! Why would you say something like that?!" "All right, knock it off!" O'Reilly fired back. "...You don't have any evidence!" West countered that, with no investigation, no criminality could be proven. "You take your law school at Princeton, you develop an illegality and I will put it on the air," O'Reilly said. I had to turn from this last night because I was wanting to go up side Bill's head. He knows good and well Fox does not treat everybody the same. They do seem to criticize members of the Black community a lot, especially our President.